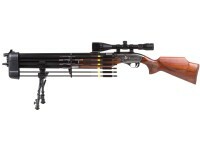 If you like to hunt and do it extensively, then the Sam Yang Recluse .357-caliber air rifle with a 500cc reservoir will give you lots of shots. Great for hunting woodchucks, nutria, possums, rats, raccoons, crows and similar-sized pests. 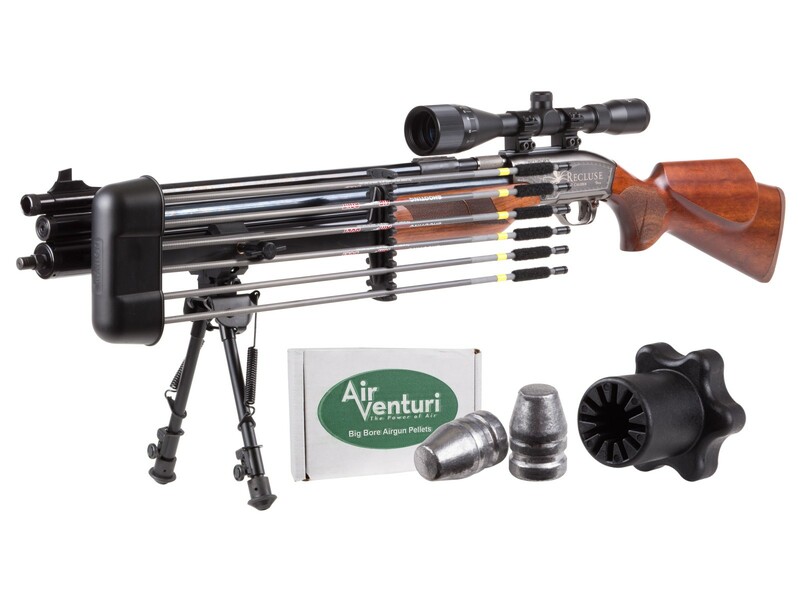 With the Ultimate Hunter's kit you have everything you could possibly want from your Recluse PCP air rifle platform! How many shots will you get from your 500cc Recluse? Our tech department filled their Recluse dual-tank air rifle to 3,000 psi, loaded it with 76-grain bullets and let loose! They shot the first 4 shots on high power. The first shot was 925 fps. Shot 4 was 890 fps. The next 17 bullets were shot on low power. Shot 5 was 855 fps, and the final shot on low power was 683 fps. That brought the tank down to 800 psi for a total of 21 shots. This shows you what one gun can do. Velocity and psi levels will vary gun to gun. Things I liked: Nice gun. Great quality! Just got my compressor with warmer weather I will really test it now. Things I would have changed: Maybe give quiver for the arrows. To much to carry around. What others should know: Nice lots of fun !